Topol found a quiet moment on a picture perfect day to visit Melbourne's Jewish Museum of Australia yesterday. 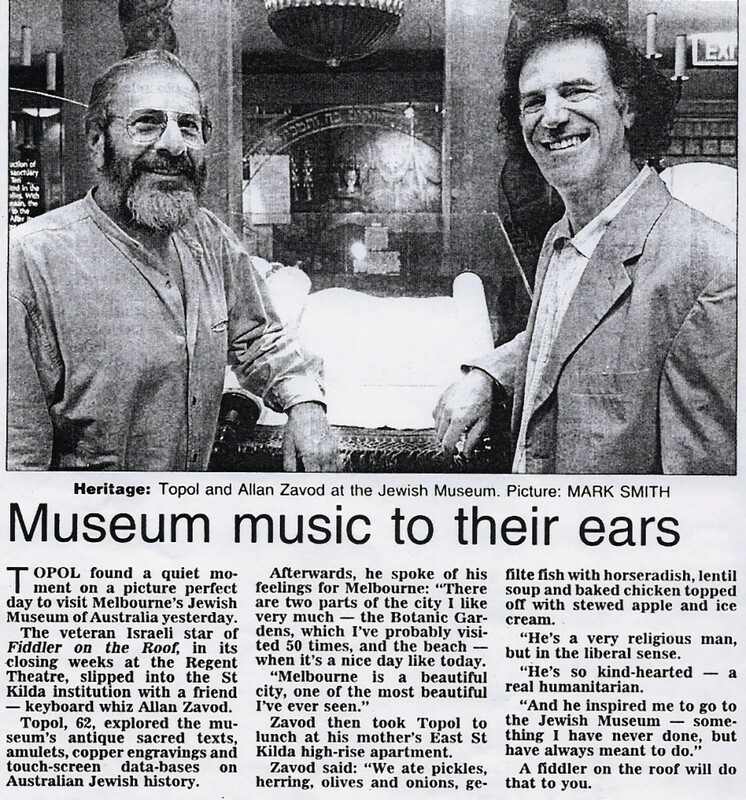 The veteran Israeli star of "Fiddler on the Roof," in its closing weeks at the Regent Theatre, slipped into the St Kilda institution with a friend - keyboard whiz Allan Zavod. 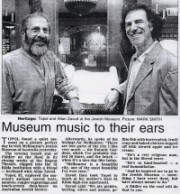 Topol, 62, explored the museum's antique sacred texts, amulets, copper engravings and touch-screen data-bases on Australian Jewish history. Afterwards, he spoke of his feelings for Melbourne: "There are two parts of the city I like very much - the Botanic Gardens, which I've probably visited 50 times, and the beach - when it's a nice day like today." "Melbourne is a beautiful city, one of the most beautiful I've ever seen." Zavod then took Topol to lunch at his mother's East St Kilda high-rise apartment. Zavod said: "We ate pickles, herring, olives and onions, gefilte fish with horseradish, lentil soup and baked chicken topped off with stewed apple and ice cream." "He's a very religious man, but in the liberal sense. He's so kind-hearted - a real humanitarian." "And he inspired me to go to the Jewish Museum - something I have never done, but have always meant to do." A fiddler on the roof will do that to you.